Leading Manufacturer of portable pneumatic tube cleaner from Thane. Water flows through the shaft . It softs the scale & flushes out from the tube. Water flows through the shaft when operator press the water gun trigger. Hollow drive shaft & hollow driven shaft can be coupled together with shaft coupling to form the required length of the tube which is to be cleaned. 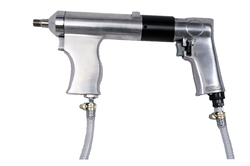 Looking for Portable Pneumatic Tube Cleaners ?